This is a photo of the INstrument for landing - Roving laser Retroreflector Investigations (INRRI) carried on the ExoMars 2016 Schiaparelli entry, descent and landing demonstrator module. INRRI is attached to the zenith-facing surface of Schiaparelli and has an unobstructed view to the Martian sky, which is essential since it will enable Schiaparelli to be located, using laser ranging, from Mars orbiters. 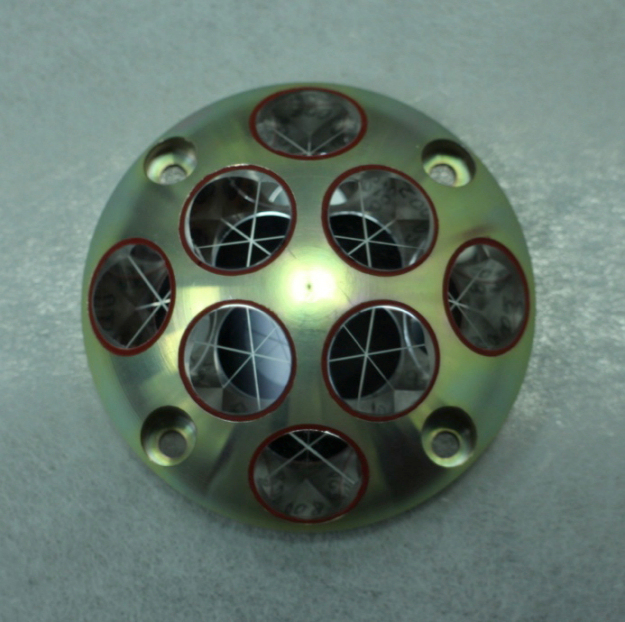 INRRI is a very compact and lightweight Cube Corner laser Retroreflector (CCR) in the form of a dome of diameter about 54mm and a total mass of 25g. The aluminium body has eight Suprasil1 (fused silica) CCR's mounted within it using silicone rubber.